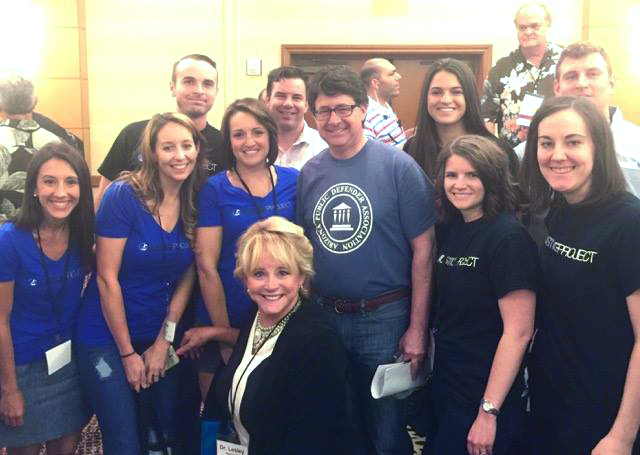 Arizona Justice Project’s team is comprised of interns, externs, volunteers, staff attorneys, and business staff. Although there are many different roles and people who fill those roles, each member of the team has key characteristics in common. We are all outspoken advocates of justice and have an undying urge to help others, especially those who cannot help themselves. This mass congregation of different people with these specific attributes is no accident. When looking at Arizona Justice Project’s mission, “To seek justice for the innocent and wrongfully imprisoned—the marginalized and forgotten of Arizona’s criminal justice system,” you can begin to understand why people with these attributes would gravitate toward Arizona Justice Project. The team believes that everyone, no matter who they are, deserves the same treatment in life and in the criminal justice system. Many people speak about believing this way, but Arizona Justice Project team lives this motto every day. For us, this means fighting for people who are accused of committing heinous crimes, such as: murder, kidnapping, burglary, molestation, etc. Working at Arizona justice Project this summer has been one of the first times in my life that I have truly seen every person treated equally, no matter what they have been accused of or who they are, and it has been eye-opening not to mention given me new perspective and insight. Arizona Justice Project helps inmates when their right to have appointed legal representation is exhausted and they have very few legal options left. Arizona Justice Project goes above and beyond to take cases of factual innocence as well as cases where a manifest injustice has occurred. Arizona Justice Project is a beacon of hope not only for prisoners with little to no options left but also for the public to assure that corruption is not occurring within our criminal justice system. Arizona Justice Project receives many applicants each month; therefore, there is an extensive review system to ensure that we are taking the most cases with merit as possible and I was a part of this system. My job within Arizona Justice Project was social media and level one intake review. I posted updates daily on Facebook and Twitter, and helped created and implement the first phase of a social media marketing campaign. In my role in level one intake review, I was involved in summarizing the documents that were sent to us by inmates, and going to the Clerk of the Court to review the case on our own without the bias of the applicant. Once all procedural history and documents were summarized, I drafted a memo to present at case rounds, where all team members are brought up to date on what is going on in each case. In addition, we received advice, guidance, and direction from the staff attorneys and business staff. The remarkable thing about Arizona Justice Project is that even though each person is overloaded with work, and there are multiple cases being worked on at once, each staff member is able to work one on one with the volunteers, interns, and externs. This collaborative approach that the project takes enables us to take more cases, be successful in more cases, and give each case the attention it needs. Working or volunteering at Arizona Justice Project is hard work that involves quite a bit of reading, writing, and analysis. Regardless of how demanding the work is, the benefits from working at the project are unbeatable. For many of the applicants, we are their last hope. We can impact their destiny in such an immense way that their fate can change from spending the rest of their natural lives in prison to being released and reunited with their loved ones. The sense of fulfillment I have experienced from working at Arizona Justice Project is unparalleled. I was able to spend my summer days helping those who could not help themselves, and I could not be more proud and thankful to have been a part of such an incredible organization.